Increase sales by showing popular products that are related to the one your client is viewing. Manually sort the order of products in the block or show your best products first. Flexible settings. Why Use Magento Related Products extension? Displaying product suggestions based on other people’s purchases is a simple yet very effective tool to drive sales. With this extension, you can show your customers what others purchased together with the product they are viewing. Let customer behavior naturally determine the best related products and boost your sales significantly. We use the extension ourselves, and we love it. Take a look at the bottom of this page to see what other Magento merchants and developers chose to buy along with this module. Leverage Related Products to benefit from implementing effective up-selling and cross-selling strategies in Magento. Relevant and personalized product offerings have a higher chances of getting into a customer’s shopping cart. Following a smart up-selling or cross-selling strategy, Magento store owners get an ability to encourage buyers to purchase more goods, resulting in increased average order values and so higher sales. Up-selling and cross-selling to existing buyers allows to decrease the overall cost of customer acquisition. Since you have already attracted a customer, it optimizes the further costs of marketing and selling new items to them. In turn, current customers are more likely to buy again, if relevant products are offered, which drives customer retentions and increases their lifetime value. The extension provides a yet another effective way to promote either new or best-selling products to the audience that might be the most interested in them. This drives more traffic to the corresponding product pages and gives an opportunity of generating new leads. Populate default Magento Up-sell, Cross-sell or Related Products block with products frequently purchased together with the product being viewed. Display only in-stock products in You May Be Also Interested In/Related Products. Display only the products that are not in cart yet. Display more popular products first. Define the number of products to show. Add products to the block manually and specify their order. The module starts working immediately after the installation. 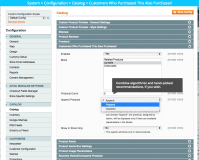 Magento Grouped Product Options extension – opportunity to select the necessary modifications of products in groups. 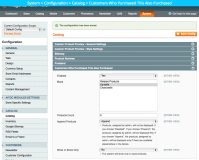 Questions and Answers Magento Product extension – Implement a virtual assistant service to help your customers. 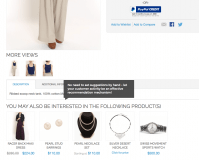 Magento Product Testimonials extension – Encourage buyers to review the purchesed products. Product Attachments plugin for Magento – Add any number of downloadable files with extra information to your product pages. Configurable Product for Magento – Creating simple associated products for configurable items. Very good and helpful extension, top communication and support. Good extension & great support!! I had some problems with showing child products of grouped products, that had been set to "not visible individually". This product were not shown in the assigned boxes, what is generally a problem of Magento, not the extension. But non the less, they applied some customization to the functionality of this extension, that meeta my needs perfectly. Thank you very much! Reinforce your marketing with timely review requests and top reviews displayed in your Magento store.